This is the official page of the Wonderful World of Disney. Here you can find information about the different parks, Disney Princess Insider, the most recent movie releases, and others. 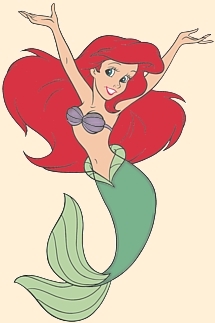 Want to know more about Ariel and the rest of The Little Mermaid gang? Then check out these links! Here you can find a great variety of Disney Merchandise. There is a lot of Ariel products including cels, snowglobes, and clothes! Send me an email with your link so I can add you here! This forum was created for all TLM collectors to display their collection and to talk about newly released or vintage Little Mermaid items!